Side Tracks are available in three sidetrack colours: white, tan, and bronze. Please choose sidetrack colour. 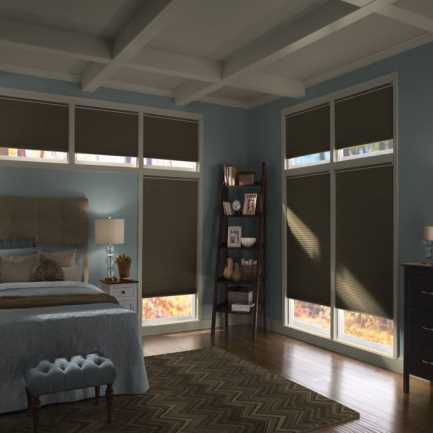 The 1/2" Single Cell Designer Plus Slumber Shade Blackout honeycomb is surrounded by the exclusive, Slumbershade side track system, completely eliminating any light to enter the room. The exclusive SlumberShade sidetrack system seals tight around the window frame, (without the light gaps you have with blackout curtains or other shades), giving the utmost perfect atmosphere for anyone to sleep in. These characteristics have made this shade, the official window covering of the National Sleep Foundation. 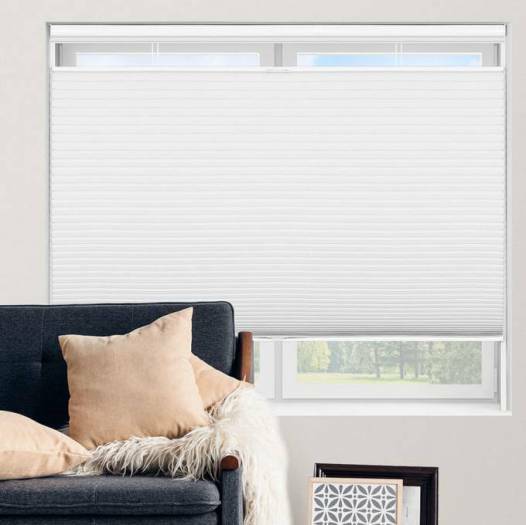 The ultimate darkness makes this shade perfect for day sleepers, baby naps, or home theater rooms during the day or anyone seeking total darkness at night as well. Great blinds as they nearly blackout the room by 100% Fairly straightforward installation and a very good design. The blinds were simple to measure and order.  The person I spoke to over the phone prior to submitting the order was very helpful and gave me confidence that this would work out. We are happy with the way the blinds block the light for a family member who works shifts and needs to sleep during the day. We were referred to Select Blinds through a friend of a friend. We saved at least $1800 purchasing 4 blinds for our basement as compared to our quote from Hunter Douglas AND we got the fully blackout blinds (Hunter Douglas was quoting us a lower model). I was pretty nervous about installing our own blinds, but after a couple of read-throughs of the instructions we started installing and everything started making sense. 2 of the 4 blinds we purchased are up and they look great! If we ever buy blinds again we'll be back. My wife and I both work shift work including midnights. We both wanted a perfect black out blind to block out all light. I searched around and found the SlumberShades and was impressed that they are endorsed by the National Sleep Foundation. I was excited to order these. Installation was easy and they work really well. I got the top down, bottom up option. They aren't 100% light blocking at the top and bottom, but very close. 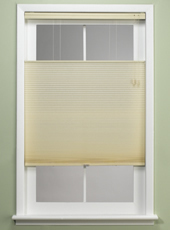 The top and bottom main pieces of the blind themselves have a slight curve or bow to them from manufacturing so they do not sit totally flush with top section or bottom of the window frame. This does let light in. I have installed an additional stick-on door seal to cover up this small gap. Works awesome! The blinds are well made, but I do think they are a bit over priced considering the extra tweaking I had to do. I do recommend them, but not the top down/bottom up style as this allows another source of light to enter the room.